Railway transport is a reliable and environmentally friendly mobility solution for the modern world. Manufacturers in the rail transportation industry need to satisfy many requirements, including safety and energy efficiency. Today, many of these issues can be addressed with the help of simulation, which can reduce physical testing and prototype creation and decrease product development time and costs. 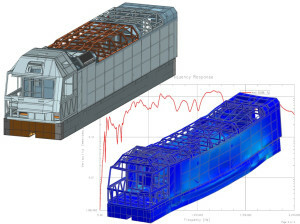 Timur Khalitov is a 3D CAE solution consultant at Siemens PLM Software in the EMEA CAE Center of Excellence. He holds a PhD in mechanical engineering with expertise in oil and gas engineering. Khalitov has more than seven years of experience with CAD, CAE and SPDM, and he is co-author of a book and technical guide on NX CAE. Your attendance at this webinar is sponsored by Siemens PLM Software.